“General elections were held in Italy on Sunday 18 April 1948 to elect the First Republican Parliament. They were heavily influenced by the Cold War confrontation between the Soviet Union and the United States, and are now best known for the covert political warfare waged by the US State Department and Central Intelligence Agency on behalf of the Christian Democratic Party (DC). 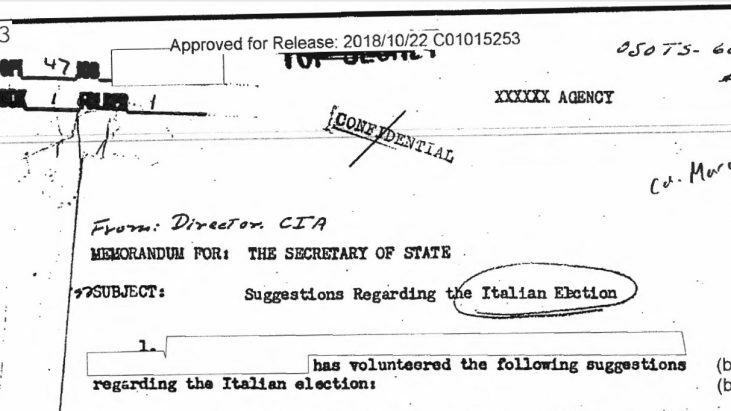 After the communist coup in Czechoslovakia in February 1948, the US became alarmed about Soviet intentions and feared that, if the leftist coalition were to win the elections, the communist Left would draw Italy into the Soviet Union’s sphere of influence. As the last month of the election campaign began, the magazine Time pronounced the possible leftist victory to be “the brink of catastrophe”. The elections were eventually won with a comfortable margin by the Christian Democracy party that defeated the left-wing coalition of the Popular Democratic Front that comprised the Italian Communist Party and the Italian Socialist Party. Below you will find documents obtained under the Freedom of Information Act (FOIA) regarding this.